Be Inspired! Take Action & Donate to Ground-breaking Post-lung Transplant Research Today! In training in the outdoor pool in Boulder, Colorado. Updates for 2019 coming soon! 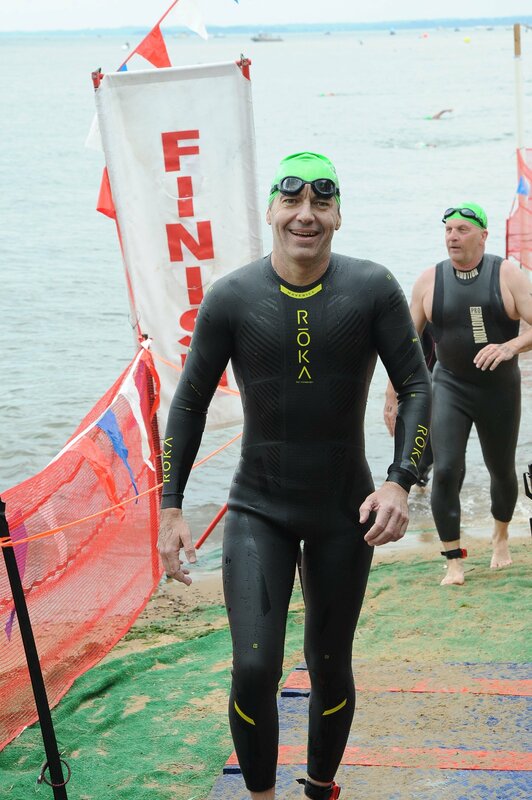 Great Chesapeake Bay Swim in Maryland on Sunday, June 10, 2018. Completed the swim crossing in 3 hours, 23 mins. Pretty good, given the tough conditions. Don't think I will do this one again next year! 2017 was not a year of big open-water swims. 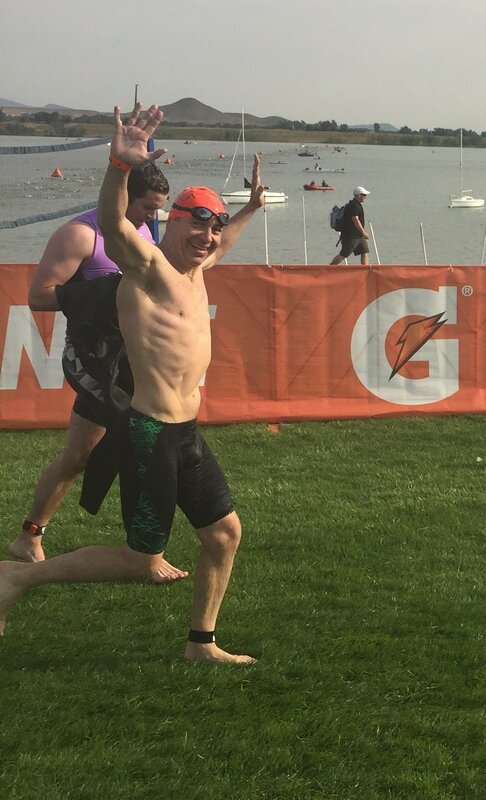 However, I did compete in a couple of sprint distance triathlons in Boulder & Steamboat Springs. 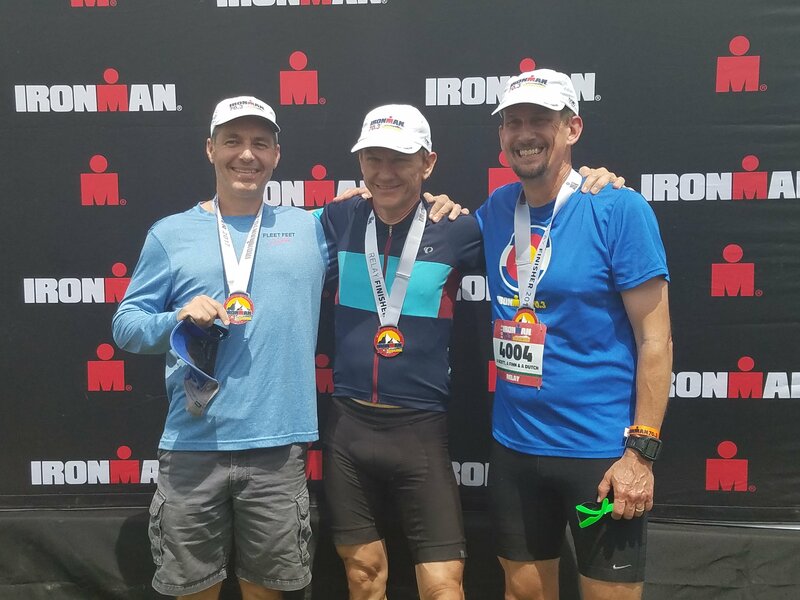 The athletic highlight of the summer was the 70.3 Ironman Relay on August 5th 2017, with my two friends, Harri Lintukorpi & Greg Lems. (L to R); Gavin Maitland (swim), Harri Lintukorpi (bike), Greg Lems (run). 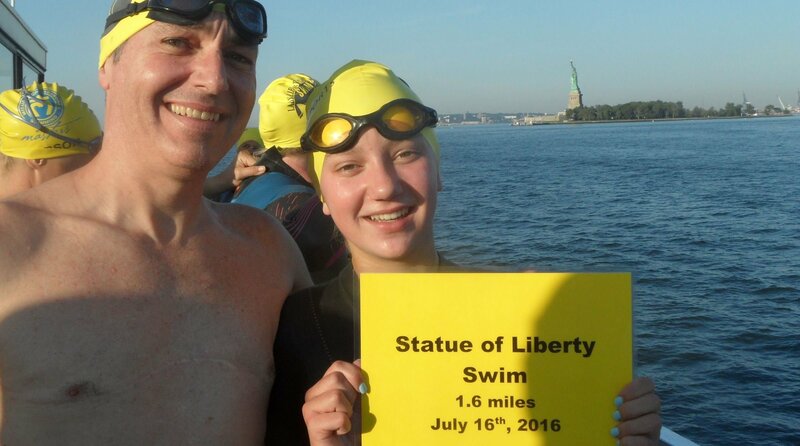 Lady Liberty swim: 1.6 mile swim from the Statue of Liberty to New Jersey: Gavin, Riley Maitland (15). Swim highlights: stunning views of Manhattan, swimming with Riley. 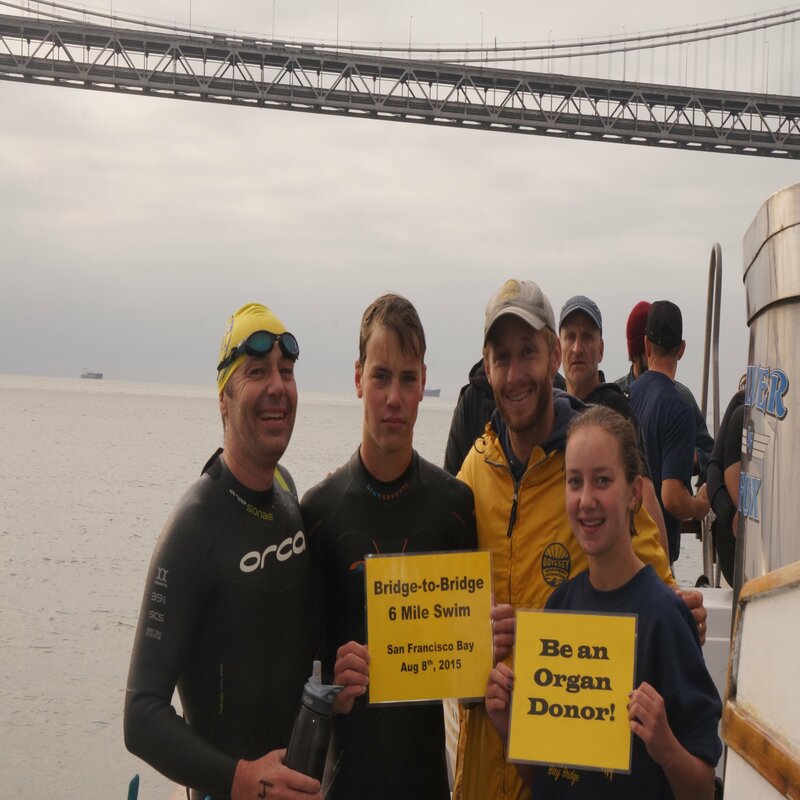 Six mile “Bridge-to-bridge” swim from Golden Gate Bridge to Oakland Bay Bridge in San Francisco bay: Gavin Maitland, Zander Maitland (16), Riley Maitland (14). Swim highlights: swimming in the dark, cold water, a real-life adventure with Zander & Riley. 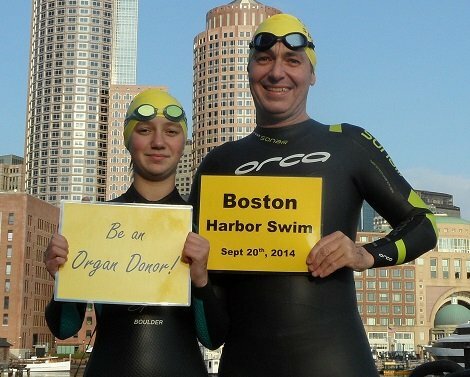 One-mile swim across the Boston harbor: Gavin, Riley Maitland (13). Swim highlights: beautiful view of Boston, swimming with Riley. 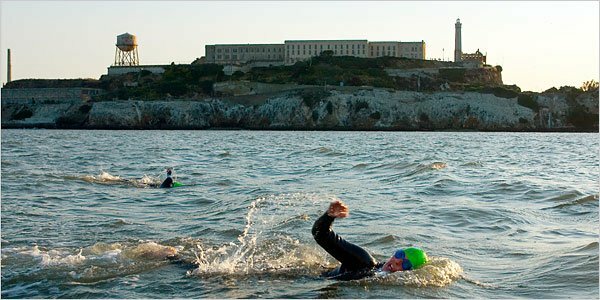 Celebrating my 5th lung-transplant anniversary by open-water swimming from Alcatraz Island to San Francisco: Gavin, Zander (13) and Riley (11) Maitland. Swim highlights: cold & choppy water, seals, wonderful views, first Big Swim with Zander & Riley. My name is Gavin Maitland. I'm originally from Fraserburgh, Scotland, and now live in Boulder, Colorado. In 2008, I was dying from an incurable lung disease and gasping for every breath. I survived thanks to a life-saving double-lung transplant at Duke University Medical Center. In 11 years since my gift of life, I have received care from Scott Palmer, MD, and his colleagues at Duke. As a result, I have been able to resume a wonderfully active (dare I say it, “normal"?) life. 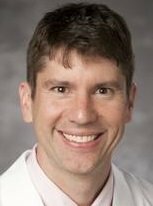 Scott Palmer, MD and his team conduct life-saving, ground-breaking research into post-lung transplant, including identifying lung-transplant patients at increased risk of rejection to allow effective treatment before complications occur. But post-lung transplant research remains massively underfunded. The bad news is that lung transplant has the worst outcomes of all solid organ transplants. The good news is that Dr Palmer and his colleagues in the Duke Post-lung Transplant Program are working to change that. If you support what I am doing, please consider making a donation. Your tax-deductible donation (US only) will positively impact families impacted by lung-transplant. Any contribution through thsi website goes directly to Dr. Palmer, and his colleagues, and will make a real difference to this cutting-edge research. Thanks to many, many generous supporters, we raised over $17,000 for Duke Post-lung Transplant Research (all funds raised went directly to Duke – no middle man, no admin fees, no nonsense). P.S. Feel free to email me with any questions, and/or to be put on my swimming email list - thank you from the bottom of my heart.